I'm a little ashamed to admit this, but last summer was the first time I bought a whole chicken because I had no idea what to do with it. Before that, I always just bought the neat little packages of boneless, skinless chicken breasts. Now, don't get me wrong - I still buy chicken breasts, but I think when you only buy them you tend to disconnect that you are eating chicken. Since cutting my first whole chicken I realize the importance that we all need to know where our food is coming from. Not even 100 years ago our predecessors didn't have a supermarket to go to. If they went to a general store it would have had very little offerings of flour, sugar, and some canned items. Advancements are great, but I do find it almost a pity that in just two generations we now give no thought to the idea of where our food comes from and the work that is put into it. How many of us know how to cut down a chicken? How many of us know how to can and put away our own food? Centuries of human experience went into the knowledge of curing, salting, and canning food for preservation. In less than 100 years that knowledge is all but lost. Buy a whole chicken. Preferably one that hasn't been pumped full of preservatives, hormones, or other funky stuff. You'll notice immediately that the price is a fraction of that charged for pre-cleaned breasts. This four and a half pound chicken was a little over $4 and is enough to feed a family of four. Open the package and remove the little parcel of giblets from the cavity of the chicken. Usually the chicken's neck, heart, liver, and gizzards are included. These can be saved for other recipes such as stuffing, gravy, or stock. I usually cook mine up in a small skillet with a lid on for my pets to enjoy. This way no part of the chicken goes to waste. Place the chicken on your cutting board with the spine facing up. Using a sharp knife cut along either side of the spine. When you get to the breast area, it will be a little tougher because of the rib cage. After making the initial cut through the meat, I actually prefer to use kitchen shears for the rest of the cutting. Once the spine is removed this can also be used for stock or gravy too. Flip the chicken over after the spine is removed. Grab either side of the chicken, by the wings and pull outwards. This will pop the breastplate which can then be removed with a little tug. At this point your chicken is butterflied. 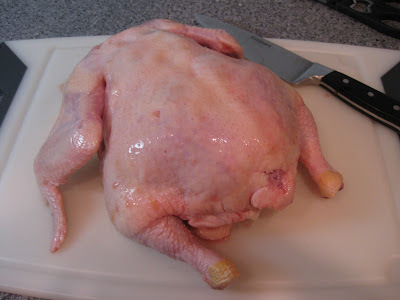 If you wish to separate the chicken in two halves, slice through the center of the chest between the two breasts. You can cook the chicken this way, or freeze half for later if you are a smaller household. One of my favorite ways to prepare a whole chicken is on the grill (chicken under a brick). Because the chicken is butterflied, it only takes about 30 minutes! Another way to prepare it is under the broiler, for about 20 minutes on either side. Butterflying a chicken drastically reduces the time it takes to cook the chicken, which keeps it juicy and flavorful. If I were to bake this same chicken whole, it would take 20 minutes per pound at 350°, which means nearly an hour and a half in the oven! Even if it scares you or grosses you out at first, give it a try. It really is easier than you think and practice will make it a breeze. Not only will your wallet thank you, but you will be proud of yourself for knowing how to tackle a whole chicken! The first time I did this by myself it must have taken 20 minutes with me pausing to look at directions to make sure I was doing it correctly. Now I can do it in 2 minutes flat and it's a great skill to know! I am so glad you posted this. I am so intimidated by a whole chicken - I have never even bought one either. Thanks for the tutorial! No need to apologize Cristo! I found both articles interesting. I had never heard of spatchcocking! But I did instruct how to crack and remove the breastbone (under the center photo - 3rd down, 3rd from bottom), which the article says is butterflying - removing both the spine and breastplate! Thanks for posting this Christina - we do whole chickens a lot - I once tried butchering it and it went bad pretty quickly! I need to try your brick chicken next - looks so good, and love how quick it cooks. No prob! You still taught me about spatchcocking!